You’ve settled down to watch TV when you notice white star-like clusters on the screen. It’s not dust and it’s not a problem with the brightness. It’s the white dot syndrome caused by a worn out DMD chip. Mitsubishi white death can be solved for under $230. 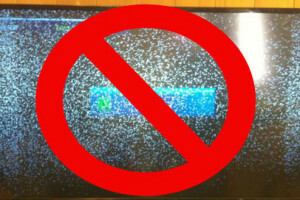 Mitsubishi DLP TVs have been plagued with the problems for several years now. Various forums talk about customers being given quotes of $600 and upwards for solving the white spot syndrome or replacing the DMD DLP chip. 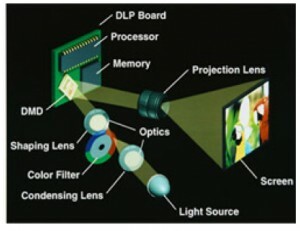 Fortunately, there are companies offering the offering the DLP chip for under $330. The white spots on your Mitsubishi WD-65736 are caused by the DLP chip being worn out. Known as Mitsubishi white death syndrome, this problem can be solved by installing a new Mitsubishi/Toshiba 4719-001997 DLP Chip 1910-6143W . WD-57733, WD-57734, WD-57833, WD-60638, WD-60733,WD-60735, WD-60737,WD-60738, WD-60833, WD-60837, WD-60C8,WD-60C9, WD-65638,WD-65731, WD-65733,WD-65734, WD-65735, WD-65736, WD-65737, WD-65738,WD-65833,WD-65835,WD-65837, WD-65838,WD-65C8,WD-65C9, WD-73638, WD-73640, WD-73642, WD-73733, WD-73734, WD-73735, WD-73736,WD-73737, WD-73738, WD-73833, WD-73835,WD-73837,WD-73838, WD-73840, WD-73C11, WD-73C8, WD-73C9, WD-75837, WD-82737, WD-82738, WD-82838, WD-Y657 WD-C657,WD-Y577. As the chip receives the signal, small mirrors rotate, either tilting away or towards light to produce those stunning images that have made RPTV a favorite for viewing. Since they are mounted on a yoke with an axle that twists in the middle, these micro mirrors get stuck so they can no longer reflect the signal. The result is a white or black dot on the screen. As more and more mirrors become stuck, more white dots appear on screen creating an un-viewable image. 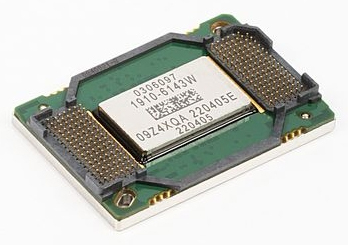 In order to address the issue, Texas Instrument has created a replacement DMD DLP chip that is affordable and readily available from recognized distributors. While part numbers may vary, the chip remains the same. Avoid an expensive repair bill and let your service center know about the DMD DLP chip for under $300. So today I called Mitsubishi about the white dots problem AND the timer issue with my TV. Same script you pay for labor they pay for part $200. Then the free bulb. After refusing that they offered to cover everything. I have to sign the documents and send them back and they will send the technician. Thanks everyone.